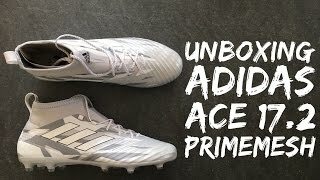 adidas market the ACE collection as providing a player with ‘Boss-level Dominance and Master of Control’ and the ACE 17.2 PrimeMesh follows in this pattern. This model isn’t as advanced as the top tier PureControl and ACE 17.1 models, but is a great and cheaper option for amateur level footballers. 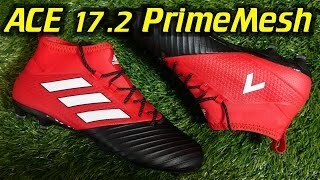 Although a lower tier the 17.2 PrimeMesh takes a lot of inspiration from the top tier ACE boots and includes high quality materials for your everyday playing needs. The boot has a wide last which combines with central lacing system to ensure a good fit for any foot width. This can also create a wider strike zone as the mid-foot has room to expand in the boot. The 17.2 uses various materials to create a comfortable fit throughout. The forefoot is PrimeMesh, while the rest of the boot consist of a neoprene material. 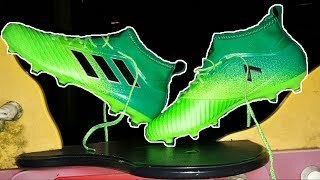 These boots have zero wear in time due to the PrimeMesh upper material, which gives players a more precise touch on the ball. The upper is comfortable and feel likes a sock when on foot, allowing you to move your foot at high speed. adidas have included their revolutionary Non-Stop Grip technology to the upper which is a texture that increases control and grip in any weather. Fit and comfort increase further with the PrimeCut collar, which provides the sock sensation around the ankle. The outsole helps a player improve their agility and move around the pitch with ease, whilst having maximum comfort, stability and protection. While the TOTAL CONTROL stud configuration improves stability and control when players are moving at high speeds. TOTAL CONTROL also provides maximum traction allowing you to explode from a standing start.